Are you already dreading the day you receive your first winter heating bill? If so, you’re not alone. The US Department of Energy estimates that nearly 45% of the money Americans spend annually on energy goes towards heating their home in winter. And since this year’s winter weather is expected to be as brutal as ever, your energy costs will be sky high once again—unless you take action now. That’s why we’re sharing the following tips to help you save money on heating your home. Try to keep the thermostat at a reasonable 68 degrees when family members are at home, and switch it off altogether when everyone leaves for work or school. If 68 degrees feels a little chilly, put on a sweater or hoody instead of cranking up the temperature. Have your older furnace inspected and/or tuned up in the fall to ensure it is able to operate as efficiently as possible throughout the winter. Monitor the filters on new and old furnaces alike and replace when necessary. 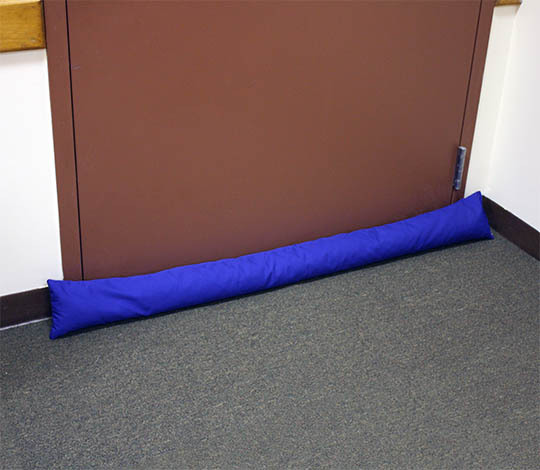 Close off the air vents and shut the doors to unoccupied rooms to avoid heating empty space. 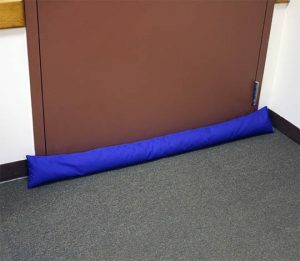 Use polystyrene bead-filled draft stoppers at the bottom of doors and around windows to prevent warm or cold air from circulating where it is not wanted. Foam Factory offers draft stoppers in two convenient sizes to help secure seasonal energy savings. Reverse your ceiling fan so that it rotates counterclockwise and forces warm air back down into the room. Doing so can yield a savings of 10% or more on winter heating bills. Open the shades or blinds to south-facing windows to allow sunlight to heat rooms during the daytime. Close the shades or blinds at night to keep the warm air in. Your whole body feels cold when your feet are cold, so put fuzzy area rugs over hardwood floors or wear fleece-lined slippers to stay comfortable. Keep extra blankets or throws on armchairs and sofas so family members can snuggle in while watching TV or spending time together without having to turn up the thermostat. If winter heating bills routinely take too big a bite out of your budget, try implementing some of these energy-saving measures around your home. Once you see how effective they are, you’ll keep using them year after year.